Ahh, these summer evenings. We complain about the heat, then long for August days during the frozen depths of winter. 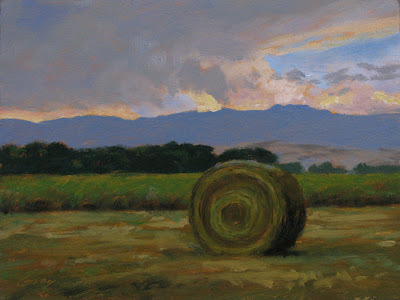 The huge round hay bales are a tempting subject to paint, with their imposing, sculptural presence. I worked the hayfields of this valley as a kid. We wrestled rectangular bales that weighed maybe 70 pounds. These round ones might weigh a ton. They are moved with tractors and specialized equipment, one person doing the work that once took a haying crew. We had this same sky last night. You captured it! Hi Don!.... Love your sensitive "found art" studies! "You" have a great eye for the unusual... splendid colour and design... "extraordinaire"
Thanks, Susan. I love these summer skies when the clouds build up in the afternoon. Hi Bruce--thanks for the visit and for your generous comments...you made my day! Love the brushstrokes and the sensitive palette. Welcome, Erik and thanks. I enjoyed seeing your blog. I admire your feeling for the true color. Thank you, Milan, and welcome to my blog.